NASA's Curiosity Mars rover has captured the planet Mercury passing ahead of the Sun, observable as a pale blackening that travels across the face of the Sun. This is the only transit of the Sun by a planet detected from any planet but Earth and also the first imaging of Mercury from Marian Surface. Mercury stops only nearly one-sixth of one pixel as seen from such far distance, so the darkening does not have a different form, but its position tracks Mercury's predictable path grounded on orbital calculations. Mark Lemmon of Texas A&M University, College Station said “This is a nod to the relevance of planetary transits to the history of astronomy on Earth. Observations of Venus transits were used to measure the size of the solar system, and Mercury transits were used to measure the size of the Sun." Curiosity completed the observations June 3, 2014, from its location inside Gale Crater on Mars. In addition to screening the Mercury transit, the same Mastcam settings show two sunspots nearly the size of Earth. The sunspots move merely at the speed of the Sun's rotation, much slower than the drive of Mercury. 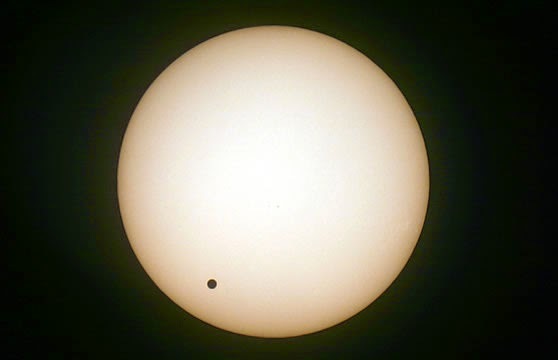 Many spectators on Earth detected a Venus transit in June 2012, the latest observable from Earth this century. The next Mercury transit observable from Earth will be May 9, 2016. Mercury and Venus transits are observable more frequently from Mars as they are from Earth. Mars also offers a vantage point for observing Earth transits. The following of each kind visible from Mars will be Mercury in April 2015, Venus in August 2030, and Earth in November 2084.